Before we get on that plane, however, we wanted to share a giveaway with you! If you joined us here on Wednesday we featured our friends at Crate Paper. Today we would love to follow that up with a fun giveaway of a Crate Paper prize package. To enter this giveaway be sure to leave us a comment below and tell us what you are most looking forward to seeing this season. Is it something specific, is it more florals, more themed product or some amazing new stamps and dies? We have no doubt we will see all of those things at Creativation! Leave your comment by midnight on January 24, 2019. Good luck! Last week we gave away a spot in Meghann Andrews new SCT365 Inside the Pocket class. If you have not heard of this class, be sure to check out the video below! Congratulations Claudine! Please send us an email to ideas@scrapbookandcards.com and we’ll get you registered in the class! I can’t wait to see all the new stamps with hopefully matching dies. And of course more amazing paper. Honestly, I would love to see more card making kits or album kits. Sometimes I hit a creative wall and it is nice to just pull out a kit and get to work. Just happy to see all the new products,I been doing more cards , but hoping to see somethings to get be back into my scrapbooking! Congratulations to the winner and SCT have fun at Creativation! What I would like to see is more cuteness in stamps and coordinating papers, stickers and die cuts. Can never have enough. Specifically, I would like to see more stamp and die sets but look forward to new patterns and colour combos in general! I think some great lines that are not too themey. I love florals, stripes, and patterns that can work easily into scrapbooking. Less bulky embellies and some navy blue alphas would be fun too!! I die for dies. These can be incorporated into many designs both in cards and scrapbooking layouts. I would love to see more stamp and die sets. I love to see all the new products. I would love to see some navy and pink in a collection. I would love to see new color ideas, dies that are unique, and items to jump start my creativity. I love all sorts of dies. Also, some more yellow with brown would be great. I’m just looking forward to seeing the new ideas and themes in the collections. Fresh inspiration! I always am excited when I see bolder color schemes. I love making cards and junk journals! I love dies, all new products are exciting. I would love ideas for cardmaking and scrapbooking. I also enjoy learning about new tools. Anything Crate Paper releases is always so beautiful, but I’m especially partial to their floral collections. I’m a huge fan of Maggie Holmes collections. They’re so fresh and fun to create with. Anything related to pocket pages or traveller’s journals! Love seeing navy and botanicals being released. Lots of great patterns and themes coming soon! I have always been the biggest Crate Paper fan! I love the quality of their paper and their emphemera is so sophisticated as you already stated. I missed out on their “Merry Days” line (:…..but am looking so forward to their spring line now! I am enjoying doing smaller projects right now – I find they are achievable and let me feel like I’m crafting in my tight schedule. The Travellers Notebook in the 😍 SCT sampler 😍 was so so very awesome and will definitively be put to use. Sorry this is so long…..thanks for the chance to win though! Thanks for the opportunity for another fabulous Paige Evans giveaway. Most interesting will be the travel and summer themed collections. I need to finish up some exploits and haven’t gotten many new items recently. I like seeing the new colors/trends and new themes. Thanks for another opportunity to win. I like it all!! I love the distressed look, I love florals, I love black and white, tone on tone, ……I like new dies from Sizzix as they cut through anything and are very sturdy. Love Crate Paper!! I’d love to see a nautical theme…or florals, no doubt whatever comes this spring will be awesome! Love Crate Paper collections! Always fun and fresh! I am looking forward to scrapping my 21 month old granddaughter! As my children are now married, have jobs, etc. my scrapping has been on the decline for years. But with this new bundle of joy, I am inspired to scrap some of the thousands of photos we have. I want to capture her every day life as well as the special occasions! Thank you for the wonderful opportunity!! I hope to see more boy-related paper and embellishments. It seems there is very little and everything is more focussed on girl- or pink- themes. I loved the Boys Rule and Cool Kid collections from Crate Paper! I love seeing all the new products! The summer season is when I take the most photos of our vacation adventures or time off with the kids, so I enjoy seeing the bright colors for summer scrapbook collections. I love Crate Paper and would like to see some kits. I get so busy at times it is nice to have some ideas to work with. I love the new products, I like to see the scrapbook ideas that I can also use for cards!!! I would love to see more cards that are directed towards just cheering people up. I know so many people who are stuggling with various day to day trials… and would love to have some inspirational quotes and happy cards to send out. Florals are my favorite of course. As a scrapbooker through & through, I love great paper & embellishments. Crate paper is one of my favourites-especially their Christmas paper. I’m hoping for some more acrylics and dimensional embellishments. Maybe buttons will make a big return. I love flowers so would love to see lots of different floral designs and die cuts. I would also love to see some stamps specifically for scrapbook designs! I’ve been on the hunt for more sentiment stamps and hobby themed stamps. Would love the opportunity to try a new brand of paper! I have never purchased Crate Paper, but they always get great reviews, so why not? I wish y’all success at create vision. I love new paper! It is so versatile. Of course, I enjoy stickers and embellishments, too! I’m anxious to see if the pantone color of the year – Living Coral is included in any color palettes. If it is, then how it is used. Awesome! I like to see more generic themes this time of year. I really love Easter and appreciate a good Vday line. But mostly I get tired of pinks and flowers. They work well in a Spring line, but not every line needs to have them. What would be awesome is a Mother’s day line w/o flowers and pink. I’ve been a mother for over 20yrs and I’ve never once since a scrapbook line that actually fits my style. I would also love it to have the #1 Mom embellishment that a lot of the Father’s day lines have but very few Mother’s day lines have them. Mother’s are A lot more than flowers. Sometimes I feel like it’s the designers easy out and I’d like to see other things. I am always looking for new dies to help me create my cards. I’m looking forward to the papers and the dies/stamps. I would really like some good card kits also. I make and send many cards each year and having some kits would be nice just so I don’t have to do all the work of designing, cutting, gathering, etc every time. I love seeing anything vintage. Love florals too. And beauty collections. Crate Paper is one of my favorite companies! Thanks for the chance to win. I love seeing the new tools that introduced during the year. that makes our crafting lives easier and more wonderful. I would love to see more stamps and dies! I especially love word dies and coverplate dies for backgrounds! I can’t wait to see new colors and papers. I would love to see more pocket page kits and themes. Also new dies and stamps. looking forward to new stamps with coordinating dies. My very favorite times of the year! It’s so exciting to see what these amazing companies have been working on and what the newest trends will be. It was awesome to see the color Purple being used more and I am hoping that will continue, also with more Blue (love the Navy, Royal & darker range). I am always drawn to a beautiful floral pattern. I’d like to see a theme of “uplifting” and some examples of how to best use printer paper, without it being too busy! “Uplifting” as holiday let down can be so very difficult for some people! Really, I’m excited and game for anything, so bring it on! That should say patterned paper! I love florals, but I am hopping to see some soft florals in neutral colors or on a neutral background. That way I can use it for all types of cards and layouts without it being too loud and girly. I scrap photos of my husband in the scrapbook and I don’t have many florals that are subtle and can work for a masculine layout. I’d like to see more “non-image” paper, like watercolor washes or ombres or something like that, rather than “patterns”. Thanks for the opportunity to win. I’m a sucker for anything outdoor/camping/wildlife or travel themed! Looking forward to seeing all the new product and trends! Thanks for the chance to win this awesome prize package! I would love more and more card kits! With matching stamps and dies! I loved the New Years paper in the SCT samplervand bought more of it. I would love to see more concert and outdoor events themed elements! I was so very looking forward to the new collections releasing this Winter, and my favorite designers have more than delivered! I needed more florals, happy sentiments, and colorful palettes to beat these winter blues; Boy, did they deliver!!! I am always looking out for all things purple 🙂 Plus, I love stamps that have matching dies. I would love to see some new embossing folders. And always, new papers! I always love to see new, trendy stamps! I’d love to see more collections using the color of the year – coral – paired with teal/aqua/turquoise! I’m always up for more flowers, but I’d also like to see new embellishments & tools. Thanks for a chance at the Crate Paper prize package! My favourite are dies, stamps, vintage and floral items. Sometimes when you see them together they are so nice. New & fresh ideas for scrapbook layouts using different mediums. Thanks for a chance to win. I would love to see more page kits…they get my creative juices flowing at the same time teaching elements of design. I’m all about the themes! More masculine (or teen guy) themes would be great! I would like to see more sentiment stamps and dies! Would love seeing more tropical outdoorsy themes, florals are always a must, but with more modern looking abstract designs! More black and white! I love to see what the trade show has in store for us this season. I would love to see more dies with stamps. Have a great time at the show. I’m looking forward to spring for the flowers and nice temperatures!!! Thanks for the chance to win! I love crate paper. I always love flowers – so I hope spring themes are BIG. I just got into copic colouring so am looking forward to some cute animal stamps and dies. Can’t wait to see what’s coming. Going to go look for a second job so I can afford it all!!!! When I first started scrapbooking…a….long….time….ago! It was the Clean and Simple that I LOVED. Now , that I am much older and retired I like a line that all goes together but has some pop! I love coordinating colours and theme and LOVE texture. I have evolved! I am adapting to so many different mediums and I LOVE it!!!! So, basically , I am gain for anything! I love seeing the new products coming in! I love paper collections that have coordinating stamps and dies! I look forward to seeing all the spring embellishments – like bicycles. I love the inspiration I see on the SCT blog. I look forward to seeing all of the new spring releases, especially patterned papers and stamps. I look forward to all the sneaks before the full reveals. It’s a fun time of year with all the new products coming out. While I love pastels, I am really looking forward to dark colors contrasting with bright vibrant colors! I wear black a lot so I like the look of bright against the black. I love paper and more paper. I would love to see this season are new layout techniques and new theme designs. I love florals and soft pastel colours on my paper crafting. Thank you crate paper for the chance to win! I’d be thrilled to win a Crate Paper prize! Their products are fabulous! From Creativation, I’m excited to see new stamps and dies! I’m a huge Crate Paper fan and always look forward to their releases. I’m looking forward to fun stamps, pretty paper and matching ephemera and stickers. I’m a die addict so I always look forward to seeing new dies. I would like to see more card kits and cards for men. I would also like to see more paper designed for male tèens and men. I’d like to see more masculine themes (teenage grandson). New mixed media products, collection lines & layered stamping! I can’t wait to see the new paper line. I am need of a refresh in my stash. Hoping for more “life” events that we all experience at one time or another but actually miss out telling them. With this we need to be reminded to be “in these moments” and document them for our families. These are times such as a first home run, being on a team at school and your teammates, the day you pass drivers education/get your beginner’s license, trip to hospital for a broken arm,etc, sleepovers with friends, vacation with your best friends family, life with a special needs child/sibling, first crush, games played with siblings, jokes always told as a child, the neighbourhood(s) lived in, all about the house you grew up in, etc. or that town you lived in with some favourite places and memories, experiencing the passing of a loved one or good friend for the first time, etc, etc. As we age there may be pictures but we forget a name(s) in the picture or just where that monument is in a town once lived in. The house you grew up in is no longer there or the one your mom or dad grew up in. Children love hearing the stories and seeing these places for real and it always is fun when you hear them telling and showing their own kids.. For the next generation!! I hope you see what I am getting at, there are always birthday, Easter, Christmas, boy, girl papers, etc. but less daily living/life happening occurrences and it all moves so fast!! I have seen some collections more recent by Simple Stories and Echo Park, and Allison Edwards (I believe her name has changed, however) always did pages about “everyday life”.but we need reminders to do that specifically and papers, embellies, stamps, words to do just that! Sorry for the length of this!!! I just couldn’t stop myself once I started, lol!! New papers in basic designs…. stripes, dots, etc and dies – I use them for different crafting! I would love to see some new travel around the world themed stamps and dies! They would be amazing!!! I am looking forward to papers I can fussy cut that’s always my favorite. Also papers with interesting prints. What I wish there was more of was collection packs! I am always looking for stamp and die sets, so some new ones to choose from would be awesome! Card kits would be great, especially geared towards generic birthdays. Cards with more general themes would be great too. Would love to see papers with more purples and greens, but not necessarily florals. I can’t wait to see what innovative new stamps and dies each company comes out with. I am also super excited for new foiling products! I can’t wait to see everything that’s new! I’m fairly new to the paper crafting world and can’t get enough of all of the wonderful design possibilities that are out there!! Thanks for the giveaway! I am most looking forward to bold stamps and dies. But all of the new items will be worth watcging for. I am looking forward to seeing more non-floral designs. And I think we’re in butterfly overload in the scrapbooking world. I hope that isn’t sacrilege. I always love new stamps and dies for my card making. Thanks for the chance to win this giveaway! I would love to see more every day paper crafting supplies. Just documenting our day to day lives is what I scrapbook about. Our son came down with strep throat and now we think our daughter has it, I went back to work full time after a 12 year hiatus, the dog has a vet appointment that my husband now has to take her to. Just what goes on every day in our lives. Just documenting living. No lamas or flamingos. No emoji’s. Real stuff. I love getting ideas/inspiration for card making. The cute styles and embellishments are what I love to see. I would love to see patterned paper that is more generic, in other words can be used on any type of layout. I’d also like to see more journaling cards. Very few product lines have them. I love deep blues and greens as well pink and would love it if product lines had coordinating card stock to go with their patterned paper. I always love seeing the latest in dies and stamps. I am looking forward to floral pattern paper – so addicted to fussy cutting right now! I’m a sucker for all types of florals, so I’m gonna have to go with that. I just love seeing new stamp sets and stencils. I’m looking forward to seeing more products to color with besides new ink pads. Powders, foils, watercolors, etc. In my scrapbook dreams I would want winter without snow in it and some rain themed I live in south so snow paper never gets used and it rains here a lot. Been to parades in pouring rain. Love the dies. Thanks for the great contest! I love all the new releases this time of year, looking forward to all of it! I would like to see some more great florals, stripes and plaids! Those are my favorite–especially diagonal stripes and plaids–so versatile! But I’m willing to see whatever is new and exciting! Hope you all are having fun at Creativation! I’d love to see more masculine themed products and I’m eager for the paper releases. So elated to see stamps and dies from Doodlebug. Thanks for the chance. Like to see more papers, patterns for the men in my life. Vibrant colors, textures, and fun ephemera to go with it. Loving all the sneak peaks and looking forward to some wonderful papers and matching embellishments!! Thank you SCT for everything you do !!! I can’t wait to see all the new products coming out! I don’t often create feminine scrapbook pages and would like to do more of that this year (which means scrapbooking me more!!) LOL! So I’m looking forward to seeing some awesome floral papers and embellishments. I’m new to card making and love to see all the new products coming out. Would like to see more products to embellish cards with and of course stamps and dies. I’d love more male themed stamps that aren’t cutesy. Oh and I’m loving stripey DP at the minute! I really love florals and super excited to get some of the new collections coming out this year. I really love colorful patterns and florals. And I would love to see more chipboard and puffy stickers. I would love to see more male inspired collections that aren’t “Dad” or “Grandfather”. I have a teenage son and one that is young 20’s but have a hard time finding collections to scrap their pictures. Thank you for all the videos from Creativation! I had fun this morning watching them and getting a look at what all is going on there!! Aimee, I agree. I have the same problem with 3 boys and 3 grandsons. We also do a lot of travelling and find that for our travels I prefer nature colours, not brights or florals. I think that i am most excited for vicki’s color kaleidoscope line to hit the stores. I am looking to some new collections from my favorite designers . . . Maggie Holmes, Paige Evans and Shimelle to name just a few. They are all such talented women!! I am looking forward to bright colors and fun themes, something which seems to be in abundance at 2019 Creativation. Lookung forward to new collections by Shimelle, Jen Hadfield, Vicki Boutin, Doodebug, Bella Blvd and Maggie Holmes, of course! I am most looking forward to baby animals. They are always my favorite new stamps. Any of course, no paper crafter can saw I look forward to new pattern paper!!! I am looking forward to the bright happy colors of Spring and that gorgeous blue that Maggie Holmes is known for. Love all things Maggie ! This collection is beautiful! I am looking for more collection by Maggie Holmes, just love her stuff! I’m looking forward to some of the new lines, Fish Tales, Best Mom, some travel lines, and would love to see some boy themed. It’s time for more chabby chic. I’d also love to see more doll stamps from Julie Nutting. Can’t wait to see all the mixed media on offer, especially from Vicki Boutin! I would love to see more layering stamps and how to create interactive cards. I probably don’t need any more florals–but that’s what I always look at and want to buy! Neutral patterns, stamps & dies are always usable. The pics I have piled up to scrap are just every day stuff like lessons, lunch and walks with friends, etc. Look forward to seeing the new releases! I love to see all the new products…paper, ephemera, dies…but it’s also fun to see the new tools and accessories they come out with! New things to learn and play with! I love paper and can’t wait to see and use all the beautiful new lines of it that were on display at Creativation! My favourite colour is peach, so I’m looking forward to all of the new products that will come out in the colour of the year! I’m looking for the new color combos… and more floral stamps and dies! Congratulations Claudine on winning a spot in the Inside the Pockets class; you won’t be disappointed! I would love to win Crate paper products; one of the best in the industry!! Thanks for the chance SCT. I am a card maker and looking for more cute stamps and dies. Especially love Crate a Paper! I’m anxious for a peach, nave and gold line. 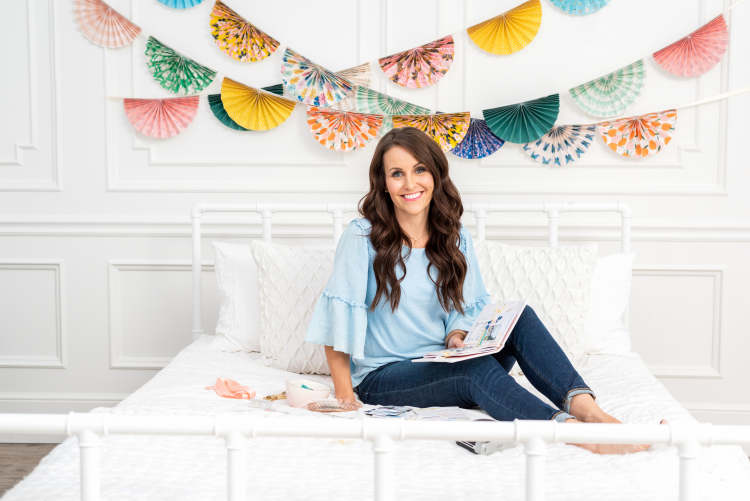 I love all things embellishments and can’t wait to get my hands on the new tissue paper flowers, metal charms and washi tape from Maggie’s new collection! I’m always excited to see new dies! But I love stamps with matching dies too! Thank you for the giveaway! The Pantone Color of the Year will be my go-to color this year! It seems like the browns and beiges are absent from most collections unless paired with oranges and yellows for fall, Sometimes I just want a quiet background that can be punched up with embellishments and pictures. Also the Boho trend is wild. Looking for papers that match the trend. This season, while it’s still wintery cold and grey in Toronto, I’m looking forward to papers that inspire me to document all the beautiful (and sometimes difficult) parts of my life last year. Love floral BUT would really love to see a few added items for men & boys. Am over run with them fellas and running out of ideas and products for cards, gifts etc for them….I also cannot seem to have enough cute animals, always want more of those too. I’m really hoping for some more awesome masculine lines! As a mom to a boy I always struggle with finding some great masculine papers and embellishments to document him growing up! I would love to see more themed stamps such as people ice skating on a frozen pond or a lily pond with cattails. I am a card maker and just love to stamp a scene. Thank you for the giveaway. Who doesn’t love Crate Paper? I have to agree with Tammy’s post though. I have 3 sons and 3 grandsons, so often find it hard to work with the girly, bright, floral papers that have dominated the market for some time. Maybe we will see more stripes, dots and nature themes? Fun new lines. I would love to see more binders to actually put our pages in! Thank you for this awesome contest. I’ve always loved Crate paper. I would like to see more card kits, of course, more paper! Also, I have so many empty tape runners and having a hard time finding the right refills to fit. Wouldn’t it be nice if they all were inter-changeable. Love ALL things Crate Paper and since travel is on my agenda for 2019 would love more goodies to incorporate for all the places on my bucket list! I love Crate Paper. I am always looking for travel paper — double-sided, naturally. I am looking most forward too the cutesy paper to do more scrapbook albums of my grandson. Loved seeing all the news from creativation !!!! Looking forward to all the new media products. Stencils and stamp products. Not a super fan of florals – I have lots – so looking for geometric patterns and more gender neutral stuff for my layouts . I just love seeing any new tools coming out! Thanks Crate Paper for this amazing giveaway! I just love seeing any new tools that come out! Thanks Crate Paper for the amazing giveaway! It’s been so cold and drab around here lately, I’m looking forward to bright springy colors! I’d love to see another cut kid collection like Cool Kid. That was my fave kid collection ever! I never got my hands on it because I was too late a bloomer! So I look forward to a repeat! I adore Crate Paper, and appreciate this opportunity to win. I would love to see new colour combinations – not just pink and coral florals, but other combinations good for boys as well as girls. Outdoor/nature themes (not cartoony) are also welcomed as we enter summer season. Hi, you sure are lucky to be able to go the Creativation event! But with the use of the internet and the live feeds, it’s almost as if we were there. What I am hoping to see this year is more ways to simplify our workspace and more storing solutions. Of course I hope to see new innovations in the stamps and dies categories. Hope you have fun. would love to see more boy themed patterned papers or papers that can be used for both boys and girls – less flowers and smaller ephemera. Thank you for the opportunity to win this. I wish I could attend Creativation, live in the area but not a “professional” in this area. I love to make unique cards–for all occasions but especially anniversary themed stuff. I make a bunch of anniversary and Birthday cards for family and friends every year. LOVE Paper Crate! I’m hoping to see some designer paper line that is for cruise theme. And of course new stamps and dies and tools. I’m looking forward to seeing new Heidi Swapp lines…especially her Wolf Pack line. Being a mother of three boys, I’m always in the market for a great boy collection! Thanks for the giveaway! There are so many fabulous new products being released, it’s impossible to know where to start. All things Tim Holtz, Concord and 9th, Vicki Boutin’s Kaleidoscope line, Crate Paper, Heidi Swapp and so much more. I would like to see a collection for scrapbooking boys or men. We are a family of mostly males and im running out of ideas. I’m in love with TN right now, so anything cute and smallish that can be used in TN would be great. I love the florals, bright, navy blue and bold, black and white patterns! Always alphas and die cuts and wood veneer. I love watching all the new releases come out! So much inspiration! I would love to see more stencils and mixed media to go along with all the beautiful new paper lines. And anything by Crate Paper and Maggie Holmes always tops my wish list! Any new Tim Holtz, Crate Paper new bold colors! I most look forward to the paper and ephemera lines put out by each company. Especially Crate Paper. I love seeing all the new papers. Thanks for the chance to win!